Dried porcini mushrooms do double duty in this healthy new take on a classic recipe. 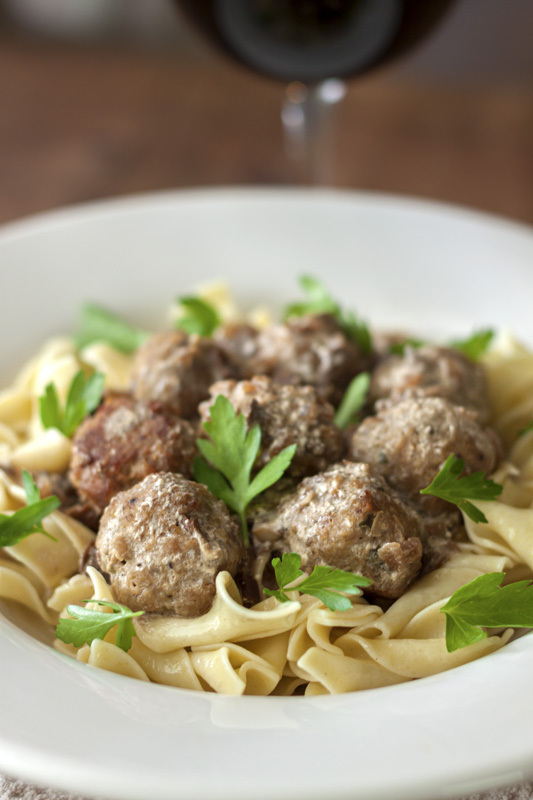 Instead of the usual beef, our stroganoff features plump little mini-meatballs made with ground turkey. Making these turkey mini-meatballs is incredibly easy; instead of frying, they bake in the oven in just minutes. Since they’re made of lean turkey and baked, not fried, they’re very low in fat. Best news of all – even without all that fat, they still taste fantastic! You can buy ready-made porcini powder, of course, but it’s a snap to make and you’ll have plenty left over to use in other recipes. Add it to your favorite pizza dough for a punch of rich, mushroomy flavor. Perk up soups, sauces and gravies with a dash or two of your own homemade porcini powder. 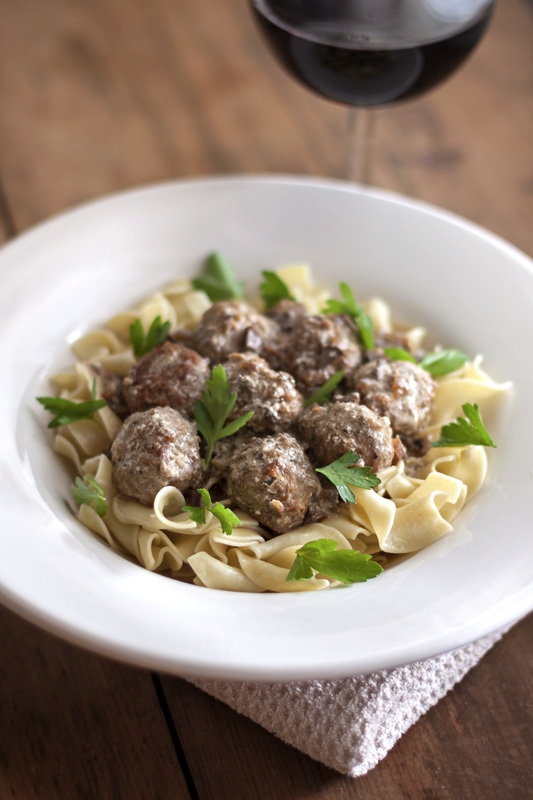 Hint: Make a double batch of these tasty & versatile meatballs while you’re at it. They’ll keep well in the refrigerator for a few days, or pop them into the freezer until they’re needed. You’ll find a thousand ways to use them. Mini-meatballs skewered on toothpicks with sweet chili dipping sauce on the side make an instant appetizer. Add savory porcini-flavored meatballs to spaghetti or make a killer meatball sandwich – the only limits are your own imagination! This version of the classic dish is already very low in fat, but for an even healthier variation, use Greek-style yogurt in place of the usual sour cream. Preheat the oven to 500 degrees F (convection 450 degrees). Spray a mini-muffin pan or baking dish with cooking spray. In a small bowl, stir together the milk and breadcrumbs and let sit for 5 minutes. In a large bowl, combine the ground turkey, garlic, scallions, salt, pepper, grated cheese and the soaked breadcrumbs. Thoroughly combine the meat mixture and then use your hands or a small scoop to shape the mixture into 2-3 tablespoon-sized balls. 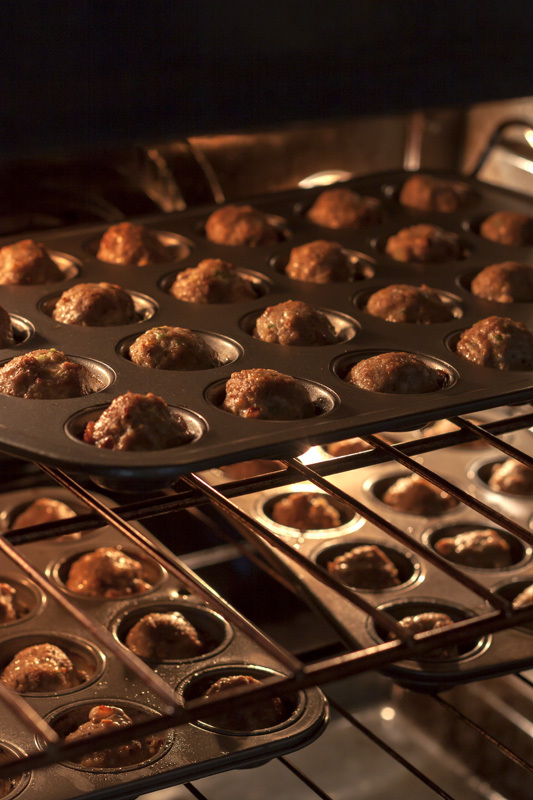 Place the meatballs into the prepared mini-muffin pan or space evenly on a baking sheet and bake until the meatballs are fully cooked, about 12-15 minutes. Keep warm. The dried porcini should be crisp enough to snap cleanly when you bend them. If they don’t, here is what to do. Take 1 oz of large dried mushroom pieces and brush away any visible specks of dirt or debris. Do not use the broken bits from the bottom of the bag; reserve them for other uses. Spread the dried mushrooms in an 8- or 9-inch pan and bake until brittle, about 3-5 minutes. Keep an eye on it and shake the pan if it needs it. In a blender or food processor, whirl the dried porcini into a fine powder. Leave the lid on and let the powder settle before removing the lid. Pour the powder through a fine strainer into a small bowl; return any remaining mushroom bits to the blender or processor and repeat. Put the porcini powder into a container with a tight-fitting lid; you’ll have plenty left for next time. Place the dried porcini in a large bowl and cover with 4 cups hot water. Allow to steep for 20-30 minutes. Strain through a sieve or cheesecloth, reserving the liquid. Rinse the porcini under cool running water to remove any traces of grit. Squeeze lightly, then chop coarsely and set aside. Heat the olive oil in a large, heavy-bottomed pan over medium high. Add the garlic, shallots and black pepper and sauté until it starts to sizzle. Add the chopped porcini and sauté for another 3-5 minutes. Add the soy sauce and Worcestershire sauce and toss. Add the red wine to deglaze and continue to cook until the liquid has reduced by half. Turn off the heat and remove the pan from the cooking surface. Stir in the sour cream or yogurt. Do not allow to boil or the sauce will break. Add the meatballs to the pan and stir gently to coat. Taste and adjust seasonings. Cook one pound of egg noodles according to package instructions. Strain, rinse and toss with 1 tablespoon of vegetable oil to keep them from sticking. Mound the noodles on the serving plate and spoon the meatballs and Stroganoff sauce over the top. Sprinkle with torn parsley leaves and serve.